Peter Pan and his feisty fairy friend Tinker Bell teach Wendy and her brothers to fly, and lead them to the magical world of Never Land, where exciting adventures await. 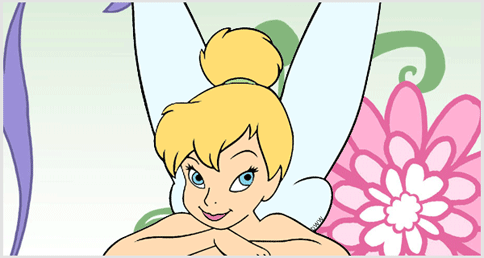 Tinker Bell appears within the first six minutes of Peter Pan, released on February 5th 1953. She is first seen flying by Peter Pan on the Darlings' rooftop. 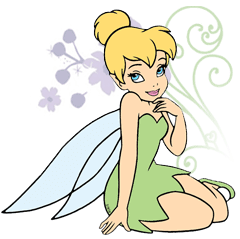 Subsequently, Tinker Bell appeared in the sequel Return to Neverland and the Tinker Bell film series: Tinker Bell; The Lost Treasure; The Great Fairy Rescue; Secret of the Wings; The Pirate Fairy; and The Legend of the Neverbeast. Tinker Bell was so named by "Peter Pan" author J. M. Barrie because she's a tinker of the fairy folk, who mends pots and kettles, and when she speaks, she makes a sound as of a tinkling bell.